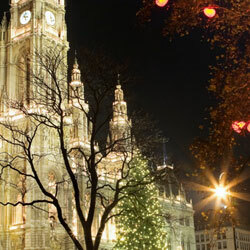 European River Cruises offered by Caddie Tours of Vienna, Virginia. Explore hidden treasures of Europe. Discover the Europe's stunning countryside, spectacular cities and ancient towns. 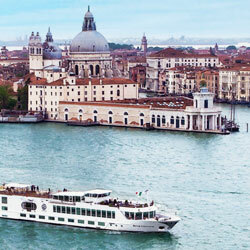 Explore Venice, Milan, Vienna, Nuremberg, and other European cities in style with Caddie Tours River Cruises. 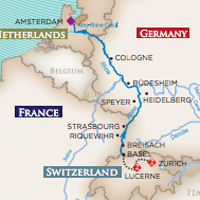 Donna Manz of Caddie Tours is your Europe and European river cruise specialist. Join us on a hosted group sailing with exclusive rates and amenities, or let us plan a custom land tour or river cruise tailored to your interests and budget. In 2016, we offered a group sailing on the luxurious super-ship, the SS Maria Theresa, visiting the medieval fairytale towns along the Main-Danube rivers, Vienna, Austria. Is there anything more appetizing than a food tour in Italy? The tour combines olive oil/truffle/wine/Norcia ham capital of Italy lies in Umbria and we are formalizing a land tour there in 2017. Of course, we will visit renowned gelateria and pizzeria in Italy along the way.